The beautiful Cherry Grove section of North Myrtle Beach, South Carolina is home to the stunning North Myrtle Beach resort of Pier Watch Villas III. This mid-size North Myrtle Beach resort is across the street from the Atlantic Ocean and white sandy beaches. The location is so convenient for a North Myrtle Beach vacation whether it is a family going on a beach vacation together or a group of golf buddies who are retreating to North Myrtle Beach to play the more than 100 Myrtle Beach area golf courses. Pier Watch Villas III is steps away from the gorgeous beaches and the refreshing water of the Atlantic Ocean in which you can swim. And there is a sparkling blue swimming pool on site at this North Myrtle Beach resort so you can take a dip there, too. This four-story North Myrtle Beach resort is constructed on stilts so the ground level at Pier Watch Villas III is covered parking. There are stairs and an elevator to help get you and your luggage, golf clubs, groceries, shopping treasures and more up to your North Myrtle Beach vacation rental at Pier Watch Villas III. 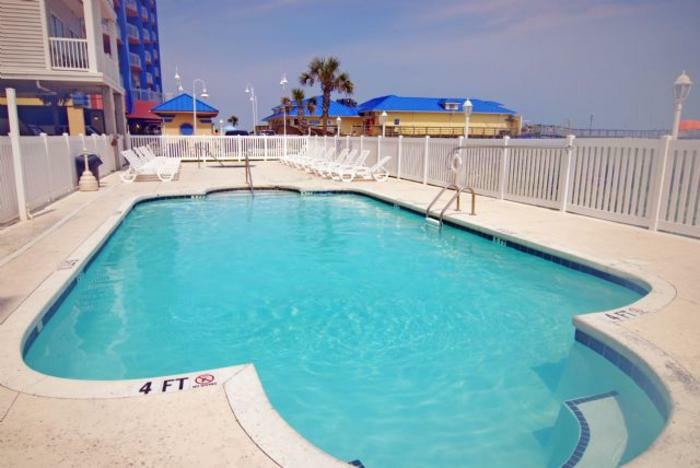 The North Myrtle Beach vacation rentals at Pier Watch Villas III are so large. You can reserve a North Myrtle Beach rental that sleeps up to 16 people. These condos in North Myrtle Beach, SC are terrific for family and friends. They are North Myrtle Beach condominium rentals that are two stories. Six bedrooms are spread out inside these beautifully decorated North Myrtle Beach vacation condominiums. You will feel so happy and relaxed in these North Myrtle Beach rentals that feature all the modern conveniences of home along with all of the creature comforts that you want during your North Myrtle Beach vacation. Tile flooring, ceiling fans, and wireless Internet access are among the amenities found in these condos in North Myrtle Beach, South Carolina. There are bedrooms in these six-bedroom North Myrtle Beach vacation rentals that have balcony access. You can find a Jacuzzi tub in one of the charming baths at this North Myrtle Beach resort’s rentals. What a nice way to relax and get rejuvenated before going out on the town for dinner and dancing and moonlit strolls on the white sandy beaches. In addition to a well equipped kitchen, an open floor plan and numerous flat-screen televisions in these North Myrtle Beach condo rentals you will find that the balconies are full of seating so your friends and family can enjoy the fresh air and sea breezes together. Admire the marsh views from your private balconies at Pier Watch Villas III. A washing machine and clothes dryer are at your fingertips in these two-story North Myrtle Beach rentals at Pier Watch Villas III. Elliott Beach Rentals is not affiliated with onsite management or the HOA of Pier Watch Villas Iii.